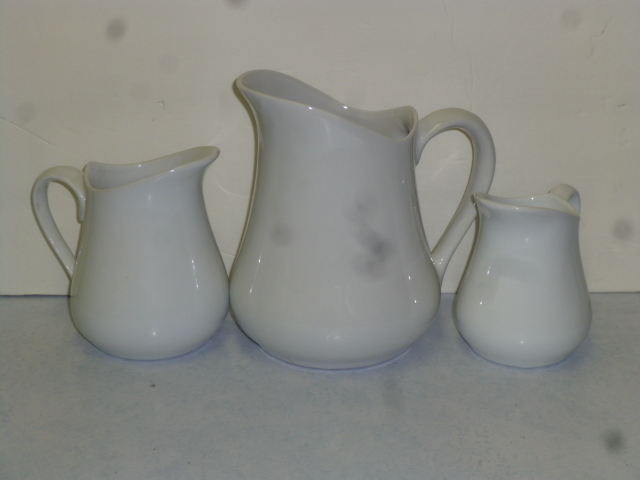 White Stoneware pitchers. (sorry about all the blotches on the pictures. Must be something on my camera lens?!) This is my very favorite shape of white pitchers, and not that readily found too often. Let alone finding ALL THREE at the same time. 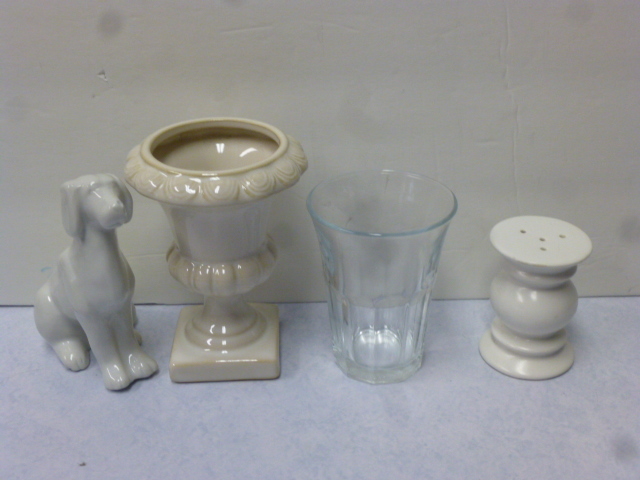 I’ve always wanted to start my own white pitcher collection, but always convince myself to sell everything I find. This time I decided to keep them! 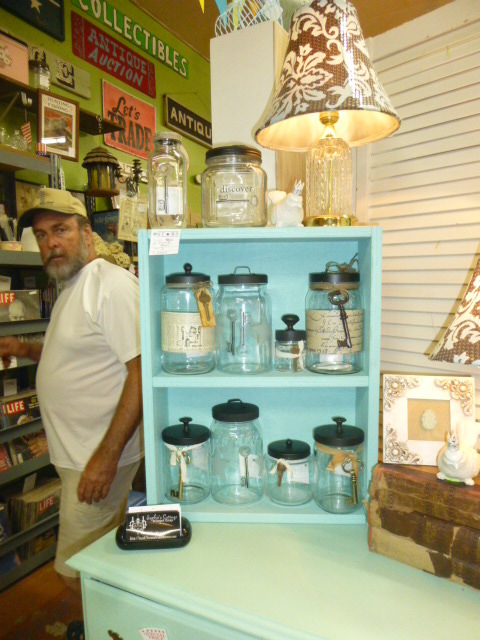 And I discovered that I had one more, a smaller one, in one of my booths to add to my collection! The bottle on the left is the one from the previous pic. 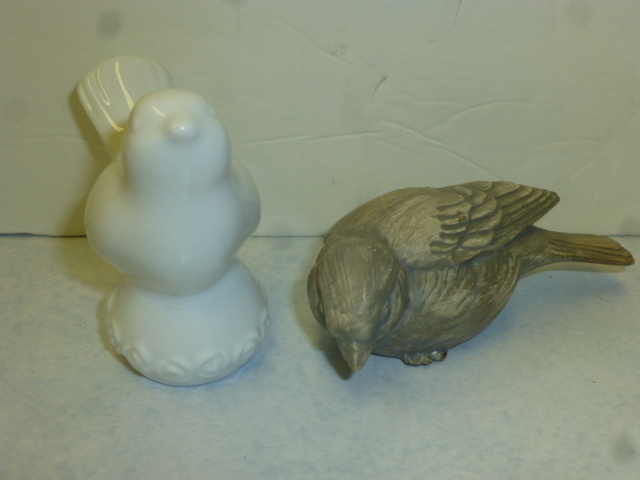 It’s the same bird as the one on the left here; that I painted white and used as a cloche handle. 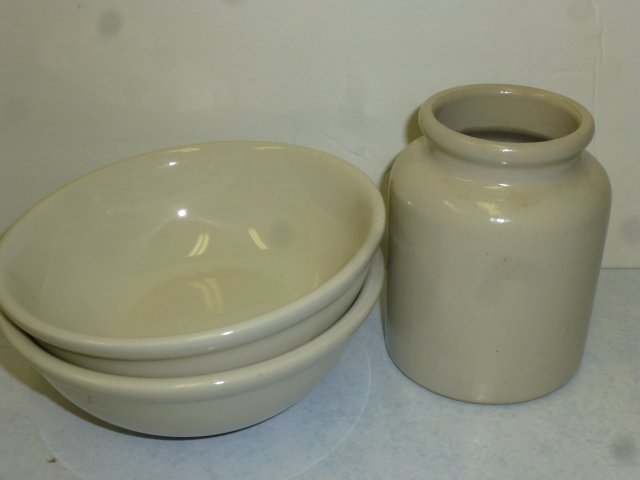 Stoneware bowls (ALWAYS on my ‘look for’ list; any shade of white/cream) Little stoneware crock that I added a Halloween label to. 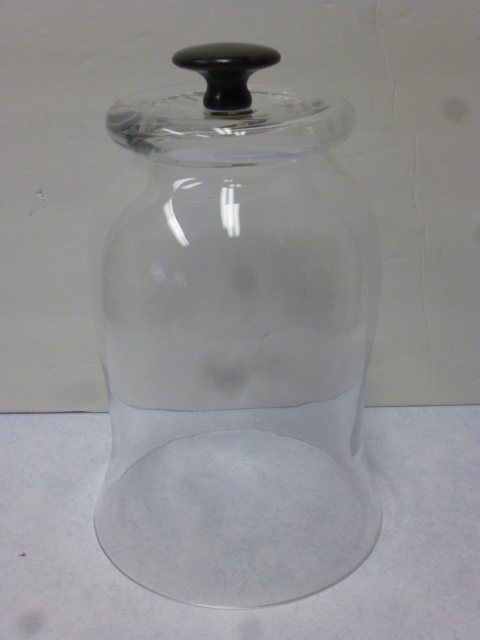 Large hurricane vase that I inverted and added a knob to, to make it into a cloche. 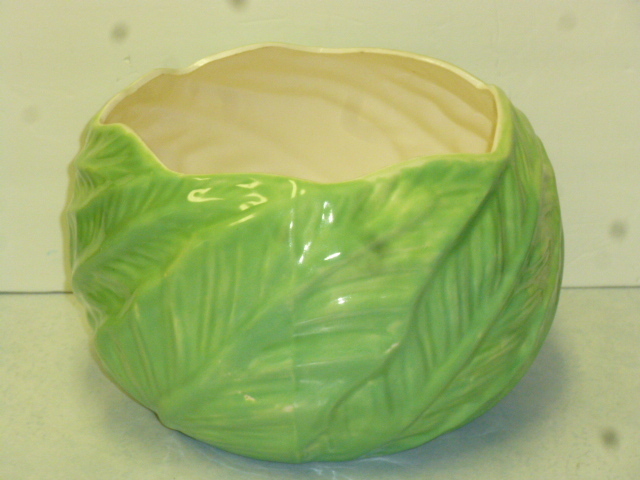 BIG lettuce shaped salad bowl! 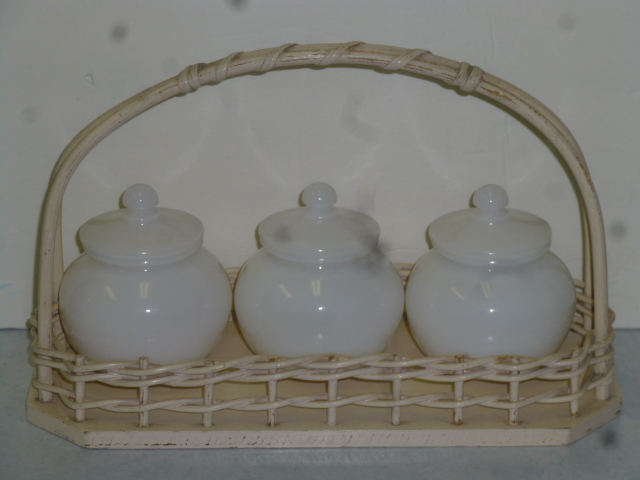 Such a cute little set of milk glass jars with wicker carrier. Any one know what this might have originally been used for?? 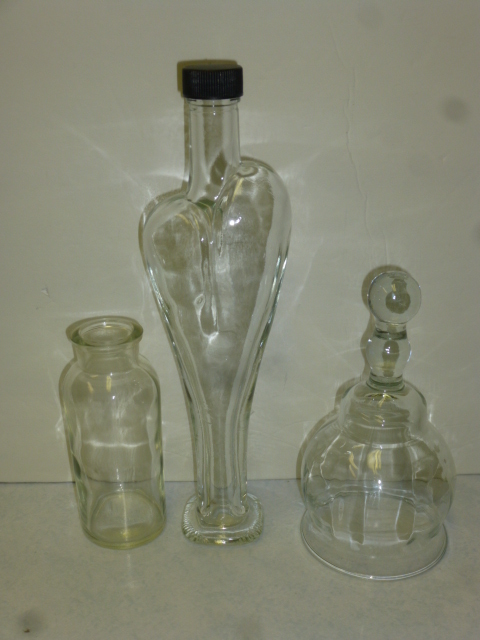 Debating whether or not to ‘piece it out’ and sell bottles and carries individually; or leave it as a set??? What do you think? One of the lids was GLUED on to the base, which we (the cashier and I) both noticed at checkout. I decided to get it anyway. Soaked it in warm soapy water for a while and it came right apart and the glue peeled right off. 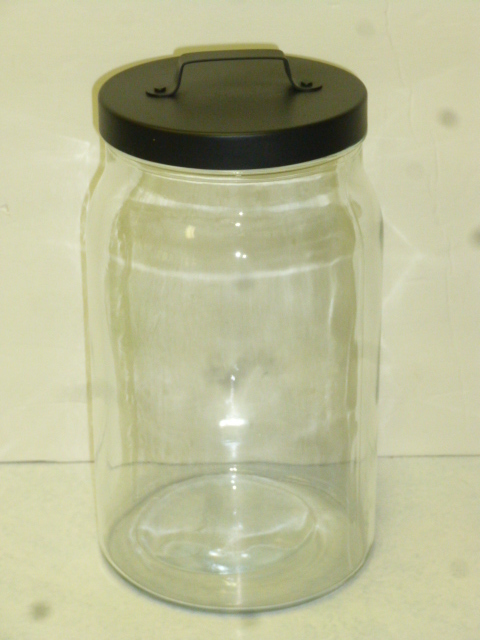 Such cute ‘pot belly’ shaped jars! Ahhhhhhhhhhhhh!!! 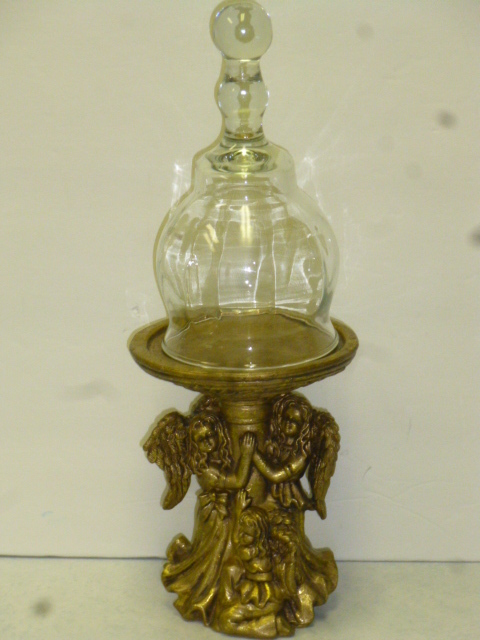 That bell cloche fits this angle candle pedestal perfectly! Maybe paint the pedestal white and pair them up?? 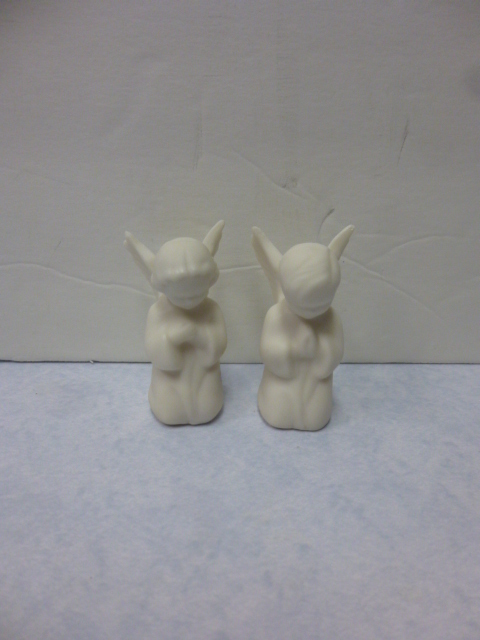 Itty bitty angels; super fragile; might have to glue them in a glass jar to protect them. 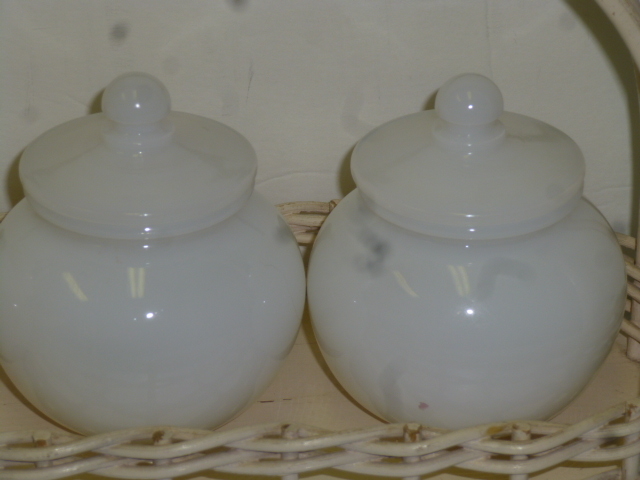 These apothecary jars originally had brushed aluminum lids; which I spray painted black. Will add some collage labels to these. 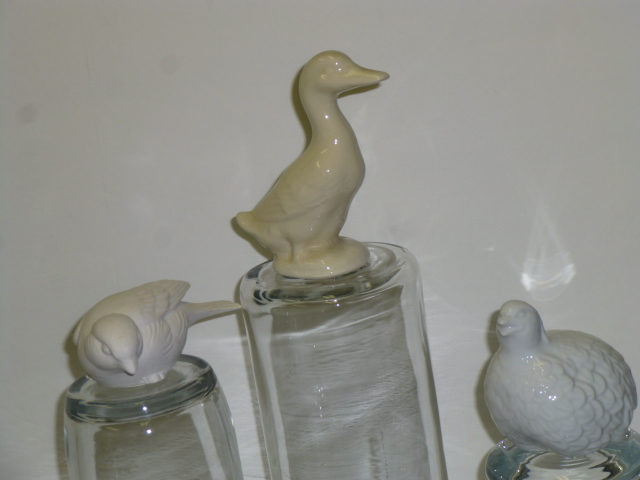 Here are some similar jars I did a while back; embellished with keys and papers. 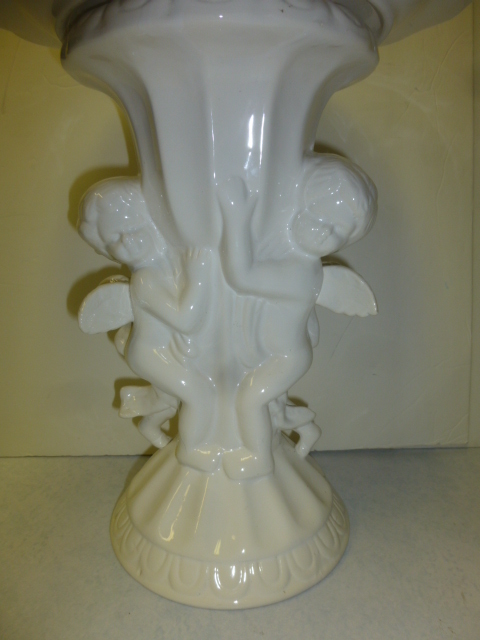 A big vintage cherub vase. 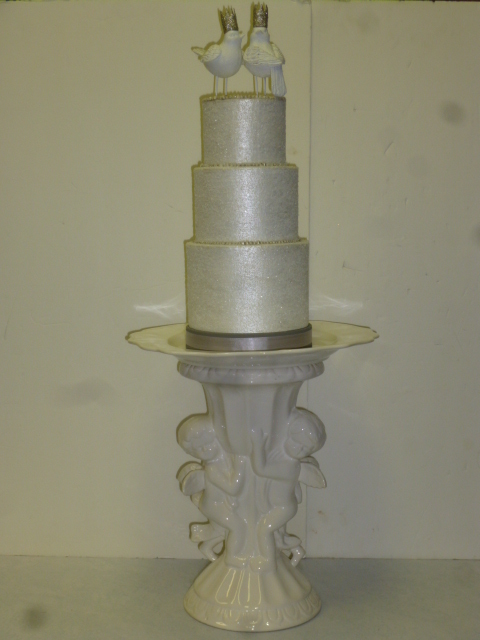 Upcycled / repurposed it into a tall cake pedestal. 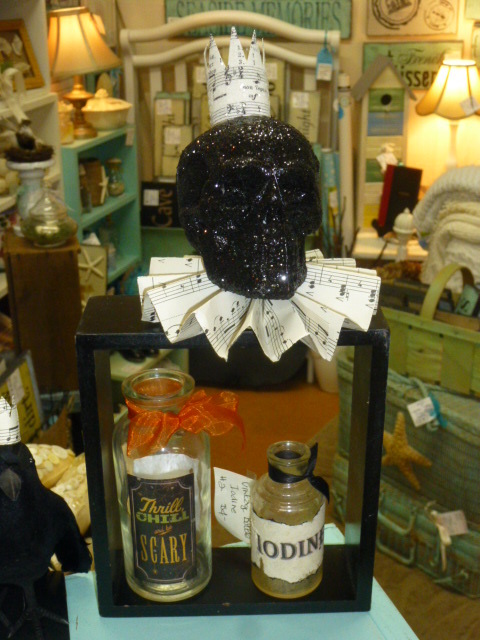 For sale in my booth at Curiosities in Beaverton for $29.00. The taller stand is $39.00. 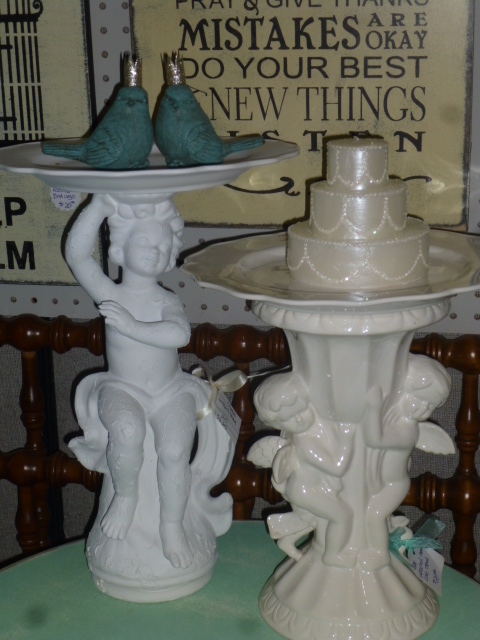 Perfect pieces for a small wedding cake OR a cupcake buffet! Could those little pots be jam pots? Glad you are keeping those beautiful pitchers! Are you going to be selling the little dog on Etsy? She’s so cute! I would be interested! The dog has a little chip broken off on the side of his nose (which wouldn’t show up in a picture) so I don’t want to list him on etsy. I’d be happy to sell him directly to you (payment via PayPal) but keep in mind that shipping will end up running more than the dog itself. To properly pack it in a priority box (so it’s insured) and depending on what zip code you are in; could be $9.95. It’s too big to fit in a small flat rate box, so that’s the next one up. The dog itself would only be $6.00. BUT . . IF there were other items you wanted to buy from my etsy shop, I could probably fit the dog in the same box at little or no additional chipping cost. Hi..do you still have the smaller vase? How tall is it? Do you still have that funky heart shaped bottle? 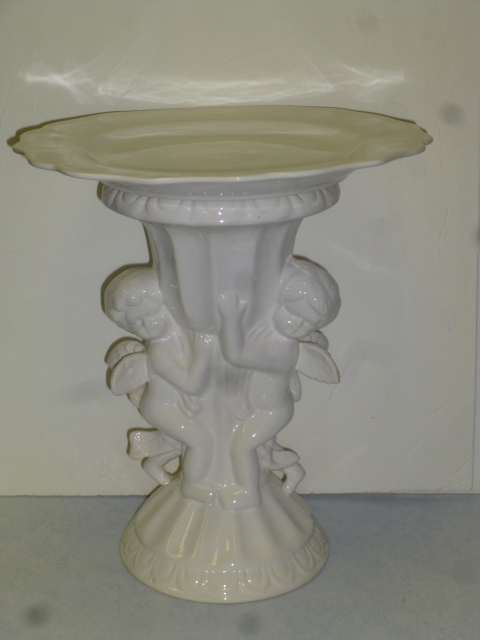 I had one just like it on my mantle that I knocked over and broke. I’d like to replace it and haven’t been able to find one. That blog entry was from over five years ago. That heart bottle is long gone. sorry.